Split system Its benefits Compatible with vertical air cabinet XAC. DescriptionRCC Condensing unit for CAP10-12-15 and C90E.The system is based onthe use of the heat/steam generated during the wash/rinse phase to preheat the water of the machine supply. Refrigerant: R410A Cooling capacity: 12,00 kW Heating capacity: 13,60 kW Floor installation. 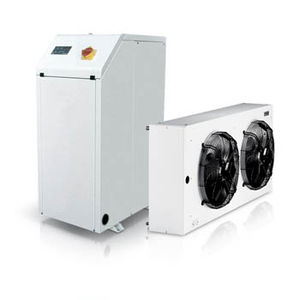 Air-cooled condensing units with Inverter. The Buéeno is designed to allow water vapor condensation in the oven outlet, limiting the release of water vapor into your bakery. CONDENSING UNIT Air cooled condensing unit and reversible condensing unit with axial fans and scroll compressors. A condensing unit is used in split-system air conditioning to evacuate hot air and produce cool air. It is normally installed outside, allowing heat to escape and keeping interior noise to a minimum. On ArchiExpo, these devices are arranged by properties such as type, installation or use (e.g., commercial). The system repeatedly condenses and evaporates a refrigerant such as freon using a compressor, condenser and evaporator. The refrigerant is compressed into liquid under pressure, which then releases heat as it passes through the condenser coils. It is then evaporated by the heat from another set coils. A fan blows the cool air surrounding these coils into the ducts of the air conditioning system. The refrigerant gas reenters the compressor completing the cycle. Consider properties such as the energy efficiency of the condenser and any environmental dangers associated with the refrigerant gas. Ensure that the power and size of the air conditioner is appropriate for the cooling needs of the space. Choose between a split or multi-split system, taking into account the volume of air to be cooled, sun exposure and the number of rooms, occupants and heat-generating appliances.